With the recent news that the revived series of Doctor Who will soon get its own spinoff series of Audio plays featuring UNIT, you might have wondered about the long history of Doctor Who on Audio. Want to dig in? There's a world of stories out there that if you just watch the show, you're missing out on! First off, a quick note: this guide will primarily focus on the Doctor Who plays made by Big Finish, who have been producing Doctor Who plays for Radio since 1999. It is only with the recent announcement that Jemma Redgrave will reprise her role as Kate Stewart from the new era of the show that Big Finish has dipped its toes into the world of post-2005 Doctor Who - previously, it was essentially off limits, so their catalogue mostly deals with what you would now call 'Classic' Doctor Who, featuring the first 8 Doctors and their companions. But even if you've only ever watched the 2005 revival, there's still plenty to enjoy. Wait, What The Heck Is An Audio Play? I guess I should probably start with this just in case you're very confused as to what the hell I'm babbling on about (don't worry, happens all the time). An audio play is essentially just that: a play, with a cast of actors, being told through dialogue and sound effects alone. You might be more familiar with an Audiobook reading or a story based podcast like Welcome To Night Vale, where a single narrator (with the occasional guest star) is essentially reading a story to you, but audio plays, the bread and butter of Who on Audio, are much different in so much as they're fully-cast productions with multiple actors, and they're less descriptive than an audio book - it's just characters engaging and interacting with each other, rather than an overall narrator describe events from a single perspective. It's a bit weird at first, especially if you're unfamiliar with the format, but imagine it like you're watching an episode of a TV show with your eyes shut. Obviously audio plays make slight adjustments to the way things are done to make up for the lack of a visual element, but that's pretty much all there is to it. He's only appeared on TV twice, but the Eighth Doctor has had an incredibly long life on Audio (remember all those names he checks before regenerating in Night of the Doctor? Those are the companions he had throughout the audio series!) - in fact, if you take those stories into account, he's technically the longest running Doctor ever! But if you've never experienced Classic-style Doctor Who, dipping into the Eighth Doctor's audio stories is as about as close as you'll get to NuWho style stories on Audio. In 2006, with the show back on TV, Big Finish revamped their line of Eighth Doctor plays with a new ongoing series called The Eighth Doctor Adventures. The format of the series, which ran from 2007 until 2011, was designed to emulate the new TV show: a new modern day companion, Lucie Miller (played by British actress Sheridan Smith), an emphasis on adventures that took place in the 21st century as well as back and forth in time, series-panning arcs, and more single part stories that were around 50 minutes long in each Eight episode 'series'. There were four series in total, and although the adventures concluded, the Eighth Doctor's journey with a new companion - a World War One nurse named Molly - continued in the ongoing miniseries Dark Eyes. If you want an easy transition between 2005-era Doctor Who and the older show, look no further than these plays. You can find them all for purchase here. The Fifth, and most recently Fourth, Doctors have a solid series of stories available on Audio that very closely try to emulate the vibes of their times on the show. Love the classic series? Look no further than here. The Fifth Doctor, of course reprised by Peter Davison, has been in plays since Big Finish started in 1999, both in short mini-series and as an regular entrant in the monthly series of plays. 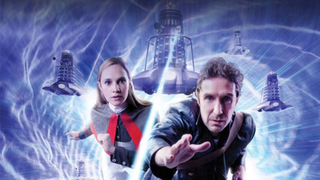 Unlike the Eighth Doctor Adventures, these plays tend to follow the format of the classic show a lot more closely, with 4 part stories that are two hours long, the equivalent of a typical serial on the old show. On audio the Eighth Doctor has spent time with every companion he had on the show, and even a new character for the plays that travelled alongside Peri, Erimem, an Ancient Egyptian princess. If you want the full Fifth Doctor experience, the 2014 series The Fifth Doctor Box Set is a pretty good stepping point, containing two adventures set early on in the Fifth Doctor's life featuring Tegan, Nyssa, and for the first time since he left the show, Matthew Waterhouse as Adric. The Fourth Doctor has only had audio adventures since 2012 - originally Tom Baker was the only surviving Doctor to decline a return when Big Finish began producing Doctor Who plays in 1999 - but he's by no means had a big variety of adventures. The Fourth Doctor has travelled with primarily with Leela on audio, although he has appeared with Romana I (for a single series of stories recorded shortly before the death of Mary Tamm in 2012) and soon, Lalla Ward's Romana II as well. It's Tom Baker at his Tom Baker-iest, and with a voice as lovely as his, he's practically perfect for audio. Want some classic, gothic-horror style Fourth Doctor? Look no further than the Phillp Hinchcliffe Presents set, featuring two stories from the man who oversaw Doctor Who's gothic-esque mid-70's era - or take a dive into his standalone range here. Colin Baker and Sylvester McCoy both got short sticks during their time on the show - smaller budgets, declining BBC support and stories that didn't quite get there lead to them often being ranked pretty poorly as Doctors by fans. But on Audio, both actors have the time that they didn't on TV to expand their characters, to extrapolate on ideas that were either cut short on TV or weren't considered at all. The Big Finish Audios turn the Sixth and Seventh Doctors into the characters they should've been in the first place. The brusque nature of the Television Sixth Doctor has slowly been turned into a more sympathetic grump, softened by his time travelling but still endearingly pompous and full of himself. The Seventh Doctor's developing nature as a manipulator, as something darker than what had gone before, has evolved on Audio to fufill the promise of the original show, before it was cut short by cancellation. But while their characters have developed and evolved over the years, they're still essentially who they were deep down in the first place - so if you were a fan of their TV adventures, you're in for a treat. If you weren't, given them a go anyway! You might like how they've turned out. Although there's a monthly series of Doctor Who stories featuring a revolving cast of Doctors and Companions in standalone one offs, Big Finish has far more to provide for stories about the wider Doctor Who universe that don't necessarily feature The Doctor - or even follow the audio play format. There's spinoffs like Jago & Litefoot, supernatural adventures featuring the comedic duo of Victorians from the iconic Fourth Doctor story The Talons of Weng-Chiang. There's UNIT spinoffs focused on the organisation defending Earth while the Doctor's away - and even one for UNIT precursor Countermeasures, based on the team featured in the Seventh Doctor story Remembrance of the Daleks. There's even Gallifrey, a multi-series adventure that revolves around Romana's time as President of the Time Lords. Several 'Lost Stories' plays exist too, stories based on scripts and ideas originally produced for TV but discarded for one reason or another. If you're a fan of the first three Doctors, audiobook-style adventures told from the perspective of (and read by) Companions like Jo Grant or Jamie, or Susan and Ian called The Companion Chronicles offer stories reminiscent of the earliest Doctor Who tales. If you're already a diehard Doctor Who fan and have yet to dip into the audio plays, these spinoff stories help flesh out the world of Doctor Who without really focussing on The Doctor himself. Want to listen but worried about shipping charges for CDs? Big Finish sells all of their Doctor Who material as digital, drm-free downloads that you can purchase world-wide through their website, but if you are a fan of the physical CDs, some American-based webstores like Who North America sell the physical copies for local audiences. What are you waiting for? Give 'em a listen!